We flew from Kathmandu to Delhi which was a 90-minute flight, so it wasn't long till we landed at the impressive Indira Gandhi International Airport which is connected to the city centre by an airport express metro line. This was our first time on a Metro system in India, and I was impressed how well it ran and on investigating it more, a lot of the city was covered by the Metro system, which benefited as there was a lot less traffic on the streets compared to Mumbai. Hopefully the traffic issues of Mumbai are vastly improved when the huge investment in their Metro project is complete. 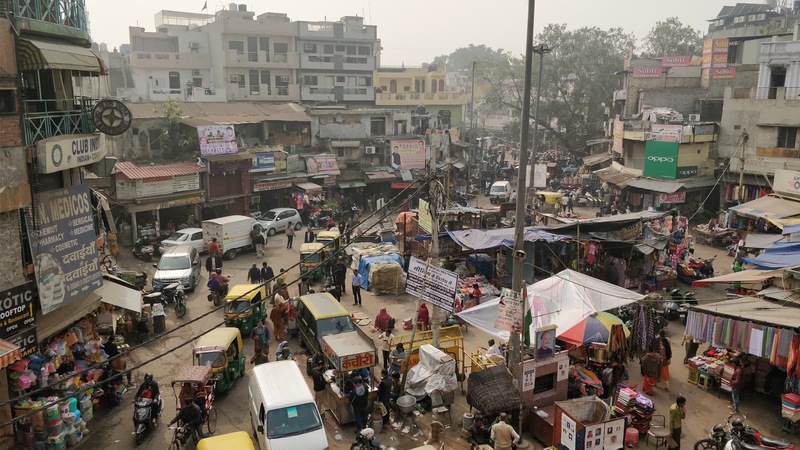 Our accommodation in Delhi was in the heart of the city, on a street called the Main Bazaar which was a 5-minute walk from the main station. Well we thought it was, but when we exited the Metro which is next door to the main station, we found that apparently, we couldn’t cut across to the other side of the station as one person in an auto-rickshaw advised us. I thought he was just at it and looking for a fare from us, so we ignored him and walked over. Next up there were police barriers up and what I assume was a railway employee wouldn’t let us through into the station without a ticket. When we explained we didn’t want a ticket as we were just wanting to cut through, he told us we wouldn’t be able to. Due to the language barrier and confusion, we went through anyway and got over the bridge guided by a local who told us where to avoid eye contact with the ticket checkers! We got checked in to our accommodation, called the SmyleInn. As it goes, it wasn’t a bad place to stay, but as expected it had an uncomfortable mattress as do most places across Asia. That evening we went for a walk through the bazaar and went towards Connaught Place which was a large circular area with outer, middle and inner circles with lots of shops, restaurants and bars. Ended up in a lovely restaurant called the Flying Saucer, which was quite posh inside, far from what it looked like from the outside. 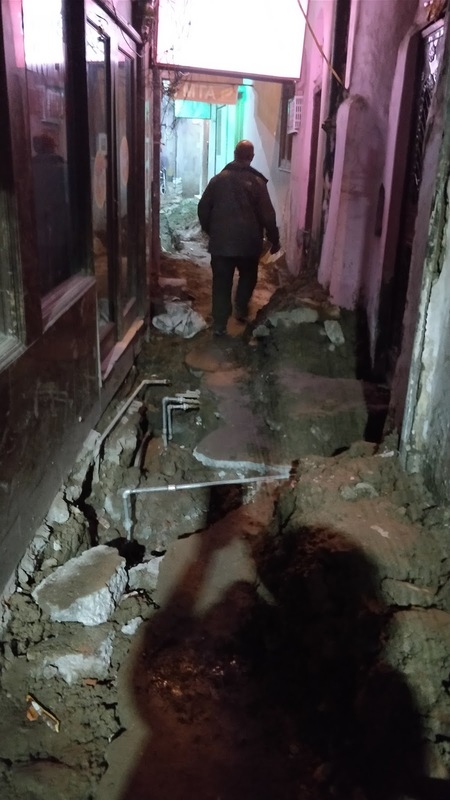 I also managed to try and take a shortcut back to the hotel, which ended up going down some right dark lanes, some of which were full of dug up trenches. The next morning, we had a lazy lie in, and in the afternoon decided to go and see a few of the popular tourist attractions. 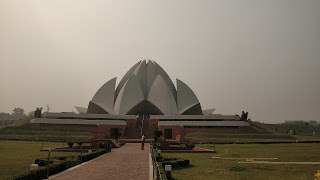 Deciding the easiest and cheapest way to get around was by the Metro, we got a smart card each, loaded some rupees on it and headed south to the Lotus Temple, which is a multi-faith religious site. It was an impressive building and set amongst lovely gardens, sadly we couldn’t get inside though. We then went back on the tram to Humayun's Tomb, which is set amongst a large gardened area with various other tombs too. 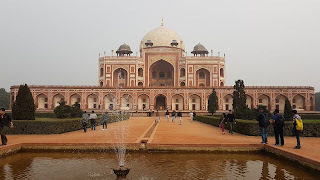 The main tomb of the Mughal Emperor Humayun is an amazing piece of Persian architecture, with lots of photos of these on the link below. Then we jumped on an auto rickshaw to Lodhi Gardens, which are a massive 90 acres of beautiful gardens, more tombs and an excited Sadie was also able to see the National Bonsai Park too. We went back to Connaught Place after that to eat, then headed back to the hotel as we had an early rise the next morning. 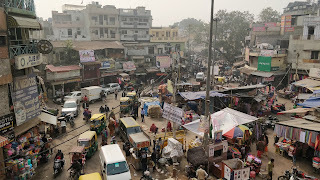 Our alarm went off at 06:00 for a 06:30 rickshaw to another main station in Delhi, called Hazrat Nizamuddin, where we had to catch the train to take us the 200km down to Agra for a day out. 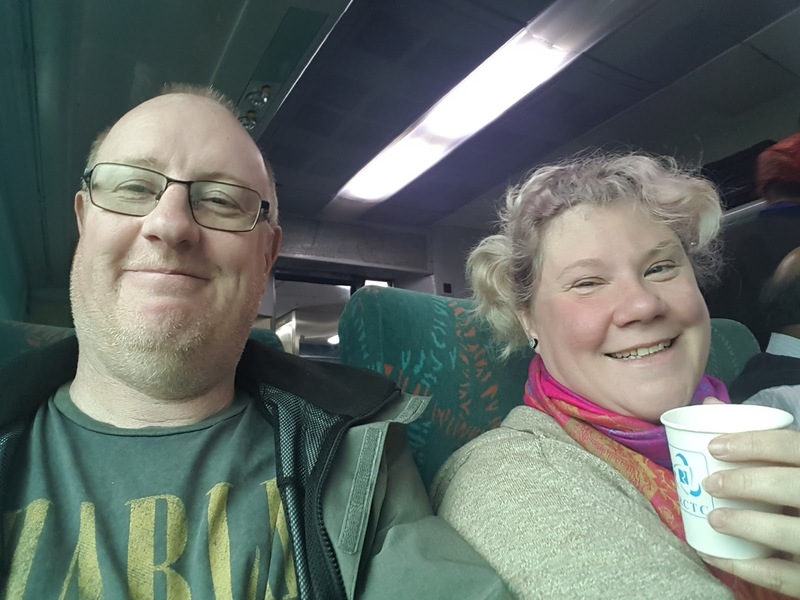 We were undecided if we wanted to do this trip, but by the time we got back to Delhi we were both glad we had made the effort. 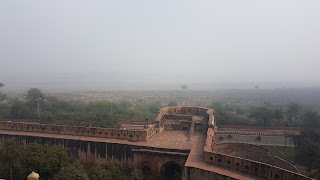 Agra is known for aggressive touts, street sellers and dodgy guides who will all try to get you to part with money, so we went to the pre-paid taxi booth and got an official taxi from the station to the nearby Agra Fort for 200 rupees. On chatting to the taxi driver, he offered us his services for the day where he would take us to the places we wanted to go, wait for us and then carry on for 500 rupees more. This seemed a bit of a bargain, he said there would be no hidden charges and as we didn’t have to pay him till the end of the day, 6 hours later... we agreed. So off we went to Agra Fort, sitting high overlooking the River Yamnuna. 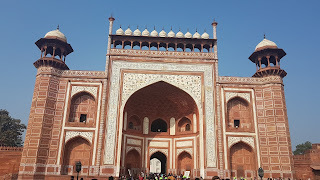 It was the main residence of the Mughal dynasty until it was shifted to Delhi. 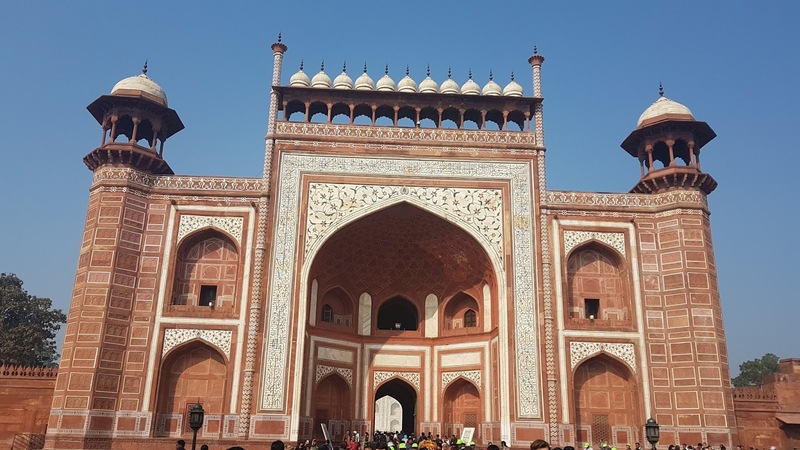 It is a mighty impressive building built pretty much entirely from red sandstone and we spent a good 90 minutes walking around the various areas. We then got taken to a small shop where marble inlays were being done, but as we knew we were not going to be buying anything, we didn’t mind plus it was interesting seeing how it was done. This was to become a bit of a theme, where he wanted to take us to a few other places, we did one more which was the Persian carpet shop, where we also seen them being made. Obviously, we were not going to buy a carpet to carry round for 10 months, and on telling the owner he seemed disappointed. We had made it clear to the taxi driver we were not going to be buying anything, which he understood, but I had read something online that these taxi drivers take tourists to various places on the hope of getting some commission on any purchases. And onwards to the star attraction, the Taj Mahal. We were dropped as near as possible to one of the 3 main gates, and then a quick rickshaw ride took us to the ticket office. Here is where you get pestered by touts, guides, sellers and people looking to ‘help’ you for a tip. We even got offered to be taken to the front of the massive queue for a fee, but on getting into the lanes we quickly realised that foreigners with what they class as ‘high value tickets’, get to the front anyway along with free shoe covers and a bottle of water. As you can expect for a place like this, security is tight and I even had to leave after getting searched to walk 5 mins away to the cloak room to store my bag as I had cigarettes, lighter, vape and sweets which are all banned. And as Sadie hadn’t seem this happen as she was in the lady’s queue, mild panic set in as she wandered what had happened to me! Once re-united, we wandered in through the Great Gate, to be greeted with the site of the marble glistening in the sunshine. I’ve only ever seen pictures of this wonder of the world, they do not do it justice whatsoever, the sheer scale of the place is breath-taking. 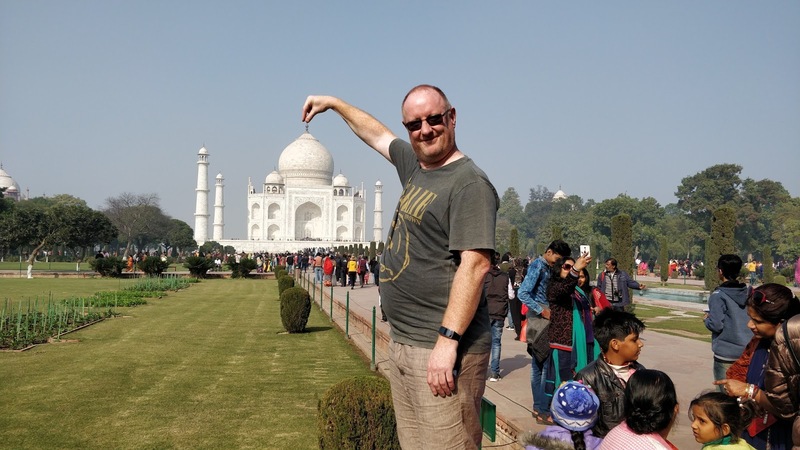 After the usual photo opportunities and selfies, we wandered closer and then the shuffle through with the crowds inside the main mausoleum to see the tomb of Shah Jahan and his favourite wife, Mumtaz Mahal who this incredible building was built for to house her dead body. A couple of hours quickly passed and then it was time to get back to our taxi, and head back to the station for our journey back to Delhi, stopping yet again at Connaught Place to a restaurant called United CoffeeHouse, which is a very grand, if not garishly decorated restaurant. 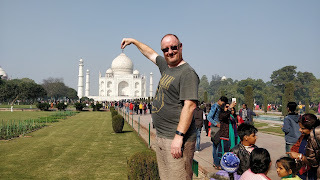 Sadly, on returning to the hotel, I had the start of a bad case of ‘Delhi Belly’ which kept me up most of the night, and pretty much put to bed any plans we had for our last day in Delhi. Which is a shame as it was a local holiday called Republic Day, which just happens to be the day they celebrate getting away from British rule, and there is big celebrations, parades etc and a bit of a party atmosphere. 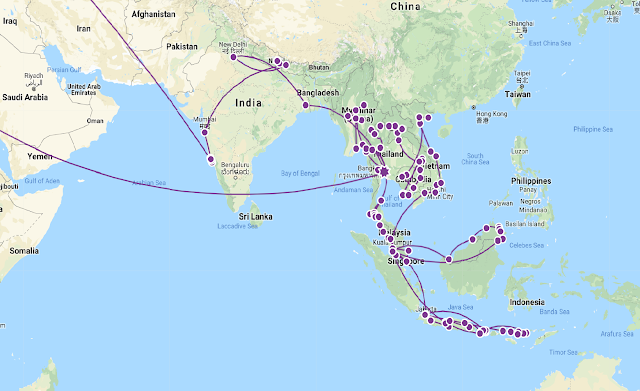 Also, the next evening we were due to get the 17hr overnight train to Kolkata, and with Sadie also feeling the effects of this, we decided to change our plans. 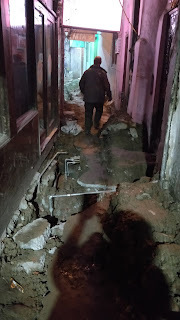 As if we needed an excuse anyway, we booked a 5* hotel near the airport for the next night, and booked flights from Delhi to Kolkata, which reduced the journey time to around 3 hours all in, much more favourable with needing being close to a decent loo! With losing my appetite and struggling to even eat a salad for dinner, we unfortunately also skipped breakfast and headed straight to the airport this morning to catch our early flight to Kolkata.